Want to become a certified paid traffic master? Learn how to drive quality traffic from platforms like Facebook, Google, YouTube, LinkedIn and build a guaranteed system for acquiring customers with our Paid Traffic Mastery Certification. Learn more now. Looking to hire a digital advertising marketer? 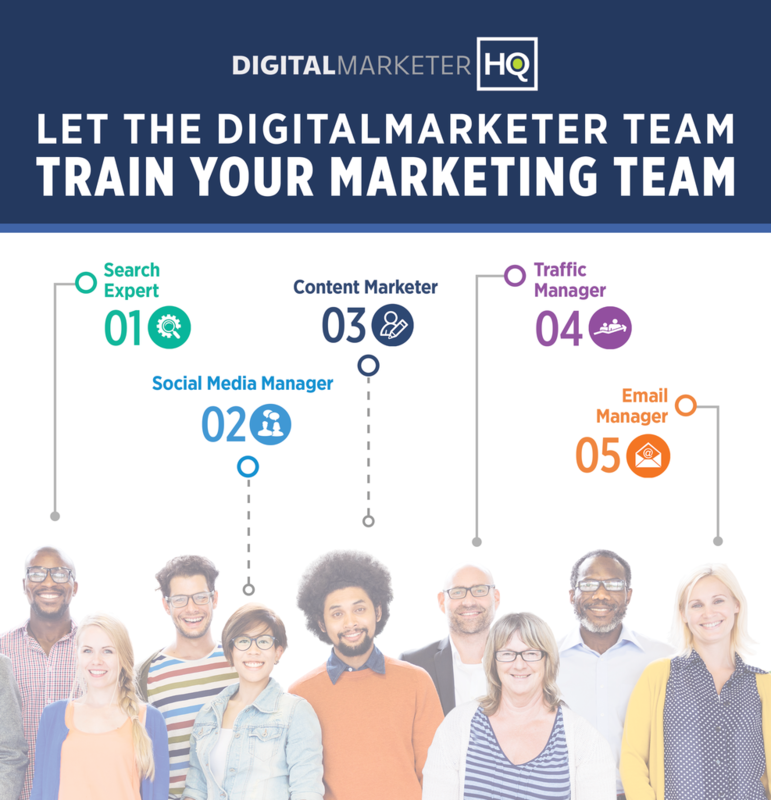 This hiring kit will give you the guidance needed to hire the right digital advertising marketer the first time. The term “digital advertiser” can refer to a wide variety of roles and responsibilities. You might be running solo and looking to bring in someone to jumpstart your digital advertising initiative. Or, perhaps your business is growing and you’re looking to add talent to an existing marketing team. It’s important to know what role you’d like your new hire to fill. A fully fleshed-out digital advertising team at a large corporation is often a part of a larger marketing team. It will include most, if not all, of these roles while a small operation might only include one. Digital Advertising Manager – The lead digital advertising marketer is responsible for directing and coordinating advertising strategies, campaigns, and budgets for assigned segments. This role is also responsible for planning, executing, and evaluating digital and online advertising strategies across all markets to meet company goals. Digital Media Buyer – The digital media buyer is responsible for creating, managing, and executing highly targeted digital media campaigns, including PPC, display, and programmatic buying. This role conducts campaign analyses and tracks analytics to achieve a positive return on ad spend. Data Analyst – The data analyst supports digital advertising initiatives by analyzing data, identifying trends, and using insights to help optimize campaigns and drive business growth. Graphic Designer – The graphic designer builds graphics and ad creatives that support digital advertising initiatives while maintaining brand consistency. Videographer – The videographer creates videos to strengthen marketing and advertising initiatives while maintaining brand consistency. In most cases, if you’re building a brand new digital advertising team, hire the Digital Media Buyer role first. The right Digital Media Buyer can be a “jack of all trades” who handles a myriad of roles and responsibilities. When hiring a one-person team, look for an individual with superb media buying skills and strong analytical and problem-solving skills. Keep in mind, though, any additional skills (graphic design or video creation, for instance) will be enormously valuable to a budding digital advertising team. The Digital Media Buyer is the foundation upon which your digital advertising team is built. Add new members to this team based on the gaps presented by your Media Buyer. For example, your Media Buyer may be great at creating Facebook advertising campaigns but not so hot at creating videos. Use your next hire to close the gaps. Use the organizational chart below when you are ready to add specialists and expand your digital advertising team. Remember, if you’re just getting started with digital media, begin by hiring the Digital Media Buyer role. Then, add other roles as the need arises. Once your digital advertising team is fully fleshed out with multiple hires in the same roles, start looking to add a Digital Advertising Manager to direct and provide strategic guidance to the team. Hiring a Digital Advertising Manager? Analyst? Designer? The Digital Advertising Manager directs and coordinates advertising strategies, campaigns, and budgets for assigned segments. This individual oversees the creation of digital advertising campaigns, ongoing creative and media optimizations, the digital analytics of all campaigns, and testing strategies. This position ensures the advertising team produces high-quality, effective advertising campaigns that align with budget guidelines. The right candidate has 2-3 years of experience managing a digital advertising team. This position requires a Bachelor’s degree in Marketing, Advertising, or Communications (or an equivalent combination of education and experience). The Digital Media Buyer, working under the direction of the Digital Advertising Manager, develops digital strategies and media buys to achieve advertising objectives. This role drives innovation on both the strategic and campaign level, cultivates key partnerships to develop the best digital media opportunities, and executes a variety of online media campaigns across display, mobile, social, and video. The ideal candidate has 2-5 years of experience in digital media buying with a focus on programmatic and/or social, A/B testing, and integrating different media channels to optimize campaign results. This position requires a Bachelor’s Degree in Marketing or Business Administration (or an equivalent combination of education and experience). The Data Analyst turns data into information, information into insight, and insight into advertising decisions. This role monitors the data behind all advertising campaigns, reviewing the campaign’s performance, targeting, ad creative, and ad spend with the goal of optimizing performance and improving ROI. This role requires strong quantitative, analytical, and problem-solving skills, and the ability to collect, organize, analyze, and report on data quickly and accurately. This position requires deep experience with Google AdWords, Facebook Advertising, and Microsoft Excel. A degree in Statistics, Marketing Analytics, or another quantitative field is preferred. The Graphic Designer is responsible for the coordination and production of all advertising creative needed for the organization’s digital marketing team. The Videographer is responsible for the coordination and production of all the video content. The right candidate has experience in directing, shooting, editing, producing, and optimizing a variety of corporate videos. The Videographer is a creative, out-of-the-box thinker, capable of translating advertising messages into compelling visual stories that are consistent with the brand. In this step, you will add detail to the role this new hire will play in your organization. Keep in mind, it’s unlikely you’ll find a candidate who fits each and every role or responsibility below. For example, you’re unlikely to find a candidate with proficiency in both advertising creative and statistics. Here, you’ll choose the specific skills required for this position. As with the roles and responsibilities section, it won’t be possible (or necessary) to find a candidate that possesses all of the skills listed below. Again, consider listing some skills as necessary and others as an added bonus. Also, list specific hardware, software, or applications your organization is using such as Adobe Creative Suite, Google Analytics, or Google AdWords in this section. Keep in mind, digital marketing is still a young vocation. While a veteran in more traditional professions (think accounting or human resources) might have 20+ years of experience, the equivalent in digital marketing might be half that. Are you offering health and vision insurance? What about 401k matching? Lastly, add a paragraph or two about your company. A successful digital advertising marketer will be required to think creatively, strategically, and tactically. They may also be required to manage people and/or projects, meet deadlines, and provide proven experience in their given field of expertise. The following sample interview questions are intentionally behavioral in that they ask the candidate to describe actual scenarios that reveal their level of experience. These are general questions that we ask our digital advertising marketer candidates and should be adjusted to fit the role for which you are hiring. Tell me about the best-performing ad campaign you’ve helped create for an organization. FOLLOW-UP: What was your role in the creation of that campaign? FOLLOW-UP: How and where did you use the campaign? FOLLOW-UP: What organizational goal did the campaign meet? Tell me about the most memorable digital advertising campaign you have worked on. FOLLOW-UP: What organizational goal did that campaign meet? FOLLOW-UP: How many team members did you work with or manage during this campaign, and what were their roles? FOLLOW-UP: Describe an obstacle you encountered in this campaign and how you overcame it. FOLLOW-UP: Did the campaign meet your objectives? If so, how did you ensure it did? Tell me about a video (or ad creative) you produced for a digital advertising campaign that boosted results. FOLLOW-UP: What tactics did you use to optimize the video (creative) for conversion? FOLLOW-UP: What challenges arose during the production of the video (creative), and how were they resolved? Tell me about a time when you used data and analytics to optimize an ad campaign (the strategy and/or assets). FOLLOW-UP: What were the metrics you found most useful? Tell me about a time when you ran an advertising campaign that failed. FOLLOW-UP: How did you discover the campaign wasn’t working? FOLLOW-UP: How did you respond? FOLLOW-UP: Were you able to salvage the campaign? If so, how? Tell me about a failing digital advertising campaign you optimized and how your efforts strengthened it. FOLLOW-UP: Was it your own campaign or someone else’s that you strengthened? FOLLOW-UP: What was your process? How long have you been doing media buying? FOLLOW-UP: What drew you to media buying? FOLLOW-UP: What has been the most effective media channel for you? Why? Is there a brand whose digital advertising strategy stands out to you, either for good or bad? Name a brand whose approach to digital advertising is worth imitating? Do you have a Google, Yahoo, or DigitalMarketer certificate? FOLLOW-UP: When did you get it? FOLLOW-UP: How has it affected your work as a digital advertiser? What kinds of resources do you use to stay up-to-date? FOLLOW-UP: Is there an expert or thought leader you tend to imitate? Why? FOLLOW-UP: How will it stay the same? FOLLOW-UP: If ads were removed from YouTube, how would you monetize it? FOLLOW-UP: If a brand-new advertising channel were to open up today, how would you go about vetting it? Have you ever had to create a campaign on a tight budget? FOLLOW-UP: What challenges did you face? FOLLOW-UP: How did the campaign perform? FOLLOW-UP: How do you see it integrating with other marketing tactics, such as content marketing or social media? Glassdoor is a free resource for job seekers to get access to over eight million company reviews, job listings, salary reports, interview reviews, office photos, and more. This allows candidates to get a good feel for what companies are like as they consider applying. Glassdoor gets over 19 million monthly visitors, the vast majority of which are in the US. If you’re looking to go the freelance route, Upwork is an online aggregator of a variety of marketers and other self-employed professionals. They have over 10 million registered freelancers and four million registered clients. While they do offer enterprise-level solutions, you can search and browse their network for free. Indeed has over 180 million unique visitors every month from over 50 different countries and is one of the leaders in job posting sites. They do offer a free option to post job listings, but they also give you the ability to get paid traffic to your listings to attract more leads. Workable is a paid tool that posts your job listing on all major job boards and social networking sites, so you can knock out your recruiting efforts in one fell swoop. It also organizes candidate resumes and has a space for notes and feedback, so you can keep all your important hiring documents in one place. SimplyHired is a targeted pay-per-click job board that includes job postings from 24 countries in 12 different languages. They get 30 million unique visits per month and over one billion job searchers every year. Congratulations on committing the time and energy to hiring the right digital advertising marketer the first time! Whether you’re hiring your first digital advertising marketer or expanding an existing team, consider onboarding your new hire the right way by certifying them as a Customer Acquisition Specialist. Watch step-by-step instructional videos on how to build successful ad campaigns on platforms like Facebook, Google, LinkedIn, and YouTube. Use the “3-Step Automated Traffic System” that builds an automated traffic system that generates leads and sales for your business 24 hours a day. Discover how to successfully scale your campaign once you have a winner so you can build massive subscriber lists while avoiding ad fatigue that can lead to increased click costs. Learn about “traffic temperature” and how media buying is actually like building an in-person relationship. Understand the five elements of a high-converting paid traffic campaign. Quit wasting time analyzing numbers that are useless to the bottom line. Learn to analyze the metrics that actually matter so you can “trim the fat” from your campaigns and scale. If you’re a business owner, this certification is a great way to learn digital advertising marketing yourself. It’s also a smart way to train and certify members of your own team to ensure they’re up to speed on the latest trends and best practices. If you’re an agency, this certification is a tangible way to show that you are a Customer Acquisition Specialist, which could help you attract and retain better, higher-paying clients. The Paid Traffic Mastery course is an advanced, 6-Module, 35-Lesson online course. At the end of each module, you will be asked to take a short quiz prior to moving on to the next module. Once you have completed the entire course, you can then sit for the final certification exam, and after passing this exam you will earn the “Customer Acquisition Specialist” designation, complete with displayable badge and printable certificate (suitable for framing).